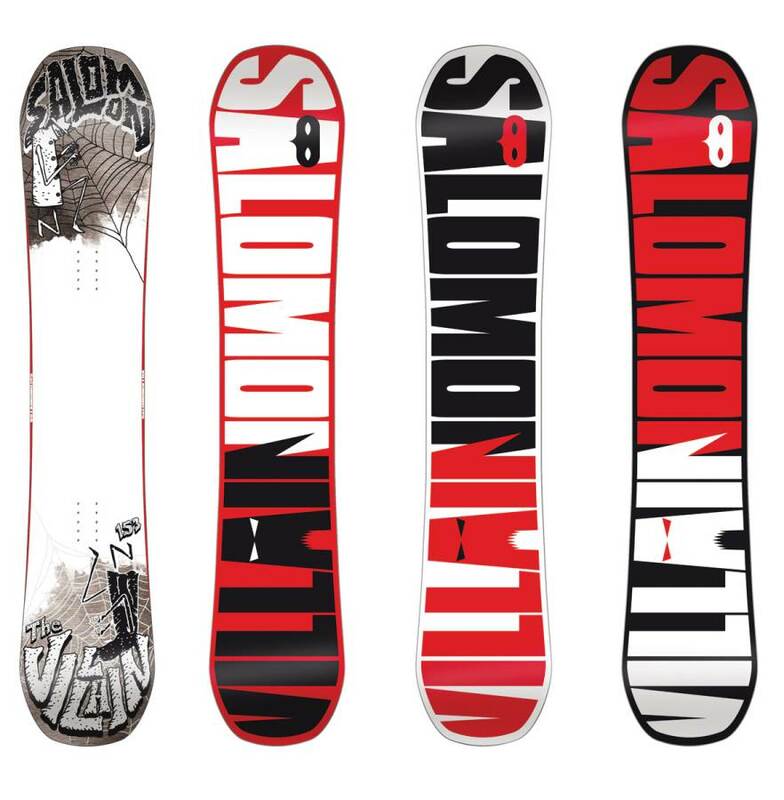 The Salomon Villain is marketed as a backyard jib board with a med/soft flex. While we agree with the med/soft flex but feel that this mostly camber profile makes it feel more like a technical camber freestyle board of the mid 2000’s. It’s more for the camber loving freestyle rider who’s looking for a camber feel with a hybrid camber after taste. Conditions: Hard Pack Sierra conditions with some icy spots at the top and some softer patches near the bottom. Other days with really good sierra snow and near perfect Colorado Snow. On Snow Feel: Maybe we were all sniffing glue that day or maybe someone put the wrong core in the first demo board we tried, but the ride was totally different than how it’s marketed. To us felt like it had a similar, very aggressive ride and feel of a more aggressive Salomon Official. 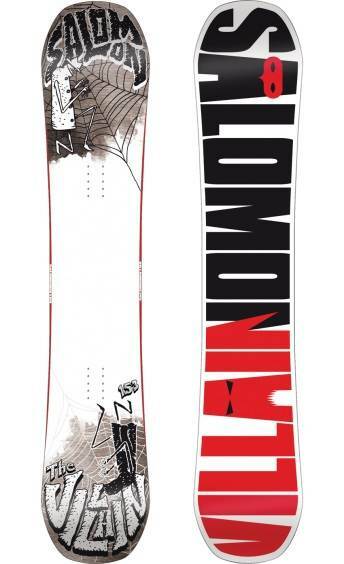 We see this as a board that isn’t for everyone but some will really appreciate it’s aggressive mostly camber feel. To us, this is a technical big jump and pipe board for the aggressive rider and not our type of jib/street board. We might of completely misjudged this board, but until we get to ride it again this is our take. Now the second, third and fourth time we tried it the flex was softer and the ride was more like Salomon described. It was more of a soft but technical camber feel type of ride that many advanced to expert all park type of riders would really like. To us it was a lot more than just a jib board. Powder: Not terribly special here and just a little better than a regular camber twin and not something we’d recommend for riding deep powder unless you are really good at camber twin powder riding. 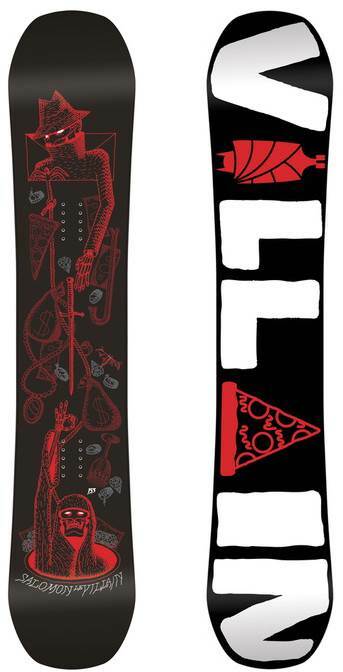 Turn Initiation- The Salomon Villain was one of those boards that surprised us here. Usually jib boards are pretty boring to turn but this had a nice lively snap edge to edge that was fun on short to wide radius turn. I liked it equally from short to wide radius turns and if you know how to turn a board then this will be quick edge to edge. If you skid your turns you will find this more challenging. Carving– Big surprise here and you can lay out a pretty hard carve if you have a little groomer to go down to get to the park. It’s no Arbor A-Frame but really fun for a freeestyle twin. Carving regular or switch is really fun. Speed: The Villain was good picking up speed for a ride marketed as a jib board and it surprised us a little here. It’s no bomber though and we did get chatter at higher speeds but does have some mountain ability that we didn’t expect. Uneven Terrain: We found the groomers to be pretty fun with the Villain but we liked it when it was smooth and pretty. The more crappy terrain we had the more we didn’t like it. The board can handle speed but when you slow down, or try to muscle your way through a hard uneven surface, or chop, the board can get cranky and cause problems. It feels like the board is reverberating chatter that should be from high speeds into the board at slow speeds and it’s tough on the ankles and knees. I call it reverse chatter. Approximate Weight- Felt pretty sturdy and a little heavier than the Sabotage but still nothing too heavy. Edge Hold: This had by far the best edge hold out of any board we tried in the Salomon line. We didn’t have ice but snowment in many places and out of all the Salomon boards we rode, this held an edge almost like a magnetraction board. We can’t say for sure this is equal to Magnetraction but pretty close and we feel it should do well on ice. 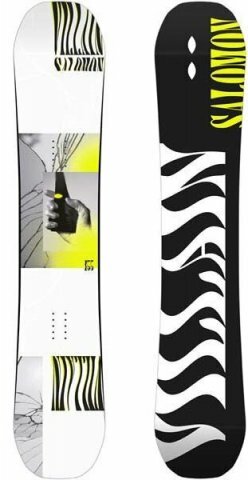 Flex: The first time we tried this board it felt like it was a lot stiffer than a 4 out of 10 but after trying it a few more times over the years we found the flex rating to be accurate. The first time we might of got a demo board with a stiffer core because after riding it a few more times the flex felt more like a med/soft 4 out of 10. It was pretty easy to butter and because of the mostly camber hybrid camber profile it had a nice snap it the tip and tail after the butter or press so it’s fun to fool around with. Jibbing– So the flex is there to be a pretty good jib board but it really feels like it’s for the advanced to expert jibber and not really a board that you want to get if you are an intermediate jibber. Pipe: The borderline excellent edge hold (if not ruined by jibbing) and springy camber shape will carve up most hard pipes and will help expert riders accomplish more. Jumps: This has nice playful pop that isn’t bad for lapping the kicker line. Also it’s pretty fun to ollie around the mountain. All in all, we felt the Villain is a well rounded freestyle ride that cal play all over the park as well as even have some fun on the mountain. To us it feels like it’s a lot more than the Jib board they market it as. We try to get as many images of the Salomon Villain, but forgive us if they're not all there. 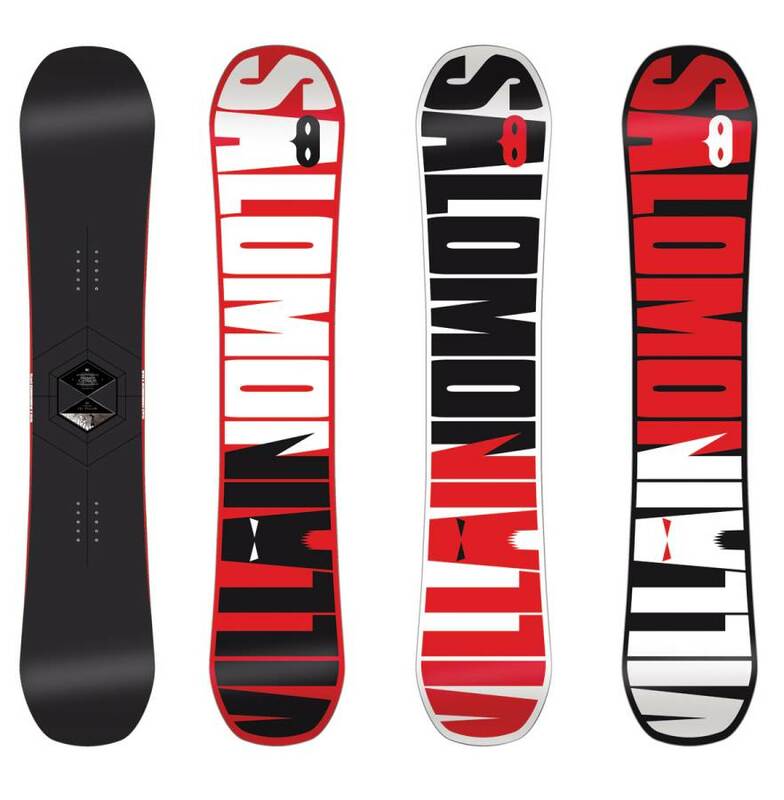 I have previous had a Salomon Villain Classicks 155 from 2015. I loved the graphics and colour and was an amazing upgrade from the Rome Garage Rocker i previously had before that. Unfortunately the board snapped within 5 weeks of getting it but Salomon were really good and warrentied it. I used this board mostly on a dryslope within the UK for freestyle. Great on kickers and features. Although GoodRIdes review was pretty spot on as far as this boards strengths, I think it could be a top choice for many people in the overall, all mountain dept as well. Great on carves, great on jumps and I really liked it in the jib park. 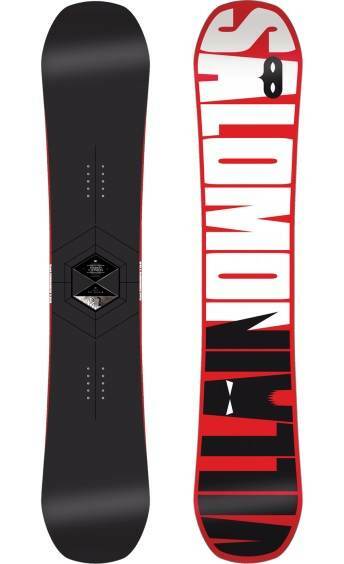 Im 185 and rode the 155 which I have coupled to Salomon Halograms (sick bindings). So if your about having fun anywhere, taking park laps, this snappy board could work for you. Great on butters too. Never rode it in the deep stuff so I cant help you there. A strong 4 stars in my opinion!